In the days and weeks following Hurricane Harvey, St. John the Divine mobilized over 600 parishioners to serve the community and assist residents in cleanup and relief efforts. SJD has developed ongoing partnerships with other local organizations as we continue the work of disaster recovery, including World Vision, Faith Memorial Baptist Church in Houston’s Fifth Ward, and long-time partner Agape Development in the Third Ward. St. John’s also recognizes the call felt by mission teams to serve in Houston. We are dedicating a portion of our facilities for dormitory use to house incoming teams from around the country who will be coming here to aid residents in their efforts to clean up and rebuild. SJD is partnering in this effort with Led2Serve, a non-profit organization which specializes in equipping, inspiring, and mobilizing mission teams. Led2Serve will offer customized Service Journeys to student and adult teams who will undertake meaningful community projects in Houston, using St. John the Divine as their ‘home base’. As we prepare our facilities, mission teams are already forming. The first Led2Serve team arrived in Houston this week and are staying in a KOA campground on Lake Conroe. The 20-person team includes 12 young men from a Catholic military high school in Kansas, a single woman and a married couple and their three children from Orlando, and two brothers from Boston. Don Callender, SJD’s Mission Team Hosting Coordinator, worked with the team members from Orlando and Boston on Tuesday, painting the interior of a home that the Agape Repair Team rebuilt after it was destroyed by fire. The team from Kansas, pictured below, is from St. John’s Military School in Salina, Kansas. The school was started by an Episcopal bishop in 1887. 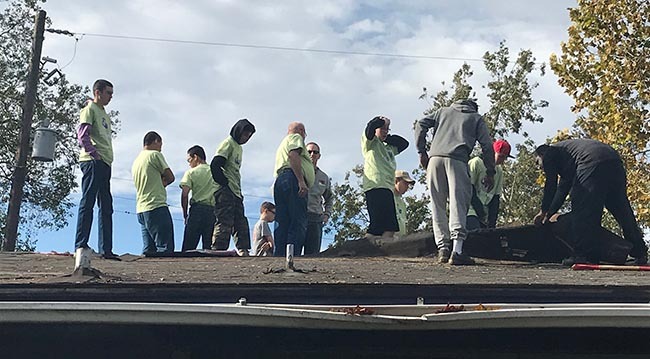 They spent the day working with the Agape repair team removing a roof from another house in the area. St. John the Divine volunteers continue to serve our neighbors who were impacted by Harvey, providing pastoral care through the Shepherds program, financial assistance through the Harvey Relief Fund, and assistance with rebuilding and recovery through volunteer work teams. Our partnership with Led2Serve will extend our reach into the community through the long-term clean-up and rebuilding of our city, and help us to mobilize even more people to change lives for God in Christ.